'Off the Shelf' is an evening of live events to be staged by UCL Slade School of Fine Art on 22 March. Taking the re-examination of the Small Press Collection of rare magazines housed at UCL as its theme, this event gives visitors the chance to engage with the spirit of the alternative 'avant-garde' press, re-visiting early texts that straddle the divide between art and poetry - including artists and writers Vito Acconci, Sol Le Witt, Ian Hamilton Finlay, Derek Jarman and Bob Cobbing. These texts will be explored through various forms of performance and accompanied by film, video and documentation from the era. Michael Duffy, artist and contributor said: "There is a huge range of research taking place in and around the Slade that's actively exploring the relation between words and images across various fields of creativity and scholarship. This takes place at both undergraduate and postgraduate level within the school and is also the focus for the Slade Word Image Forum that extends beyond the Slade to a national and international network of academics and practitioners who meet regularly at the Slade to share research. "Off the Shelf (OTS) came about as a way to bring a snapshot of this activity together alongside an exhibition of publications taken from UCL's Small Press Collection, which features unique works by eminent artists and thinkers like Richard Long and Sol LeWitt." The evening will also include new creative works by contemporary visual artists, writers and musicians, exploring the interaction between words and images and a 'speaker's corner' with short talks by members of the Slade Word/Image Research Forum. Samples from some of the works with introductions from the artists are featured below. My video installation Black Sand consists of eight single-shot one-minute sequences. The soundtrack of each film is heard on headphones and each soundtrack consists of ambient sound mixed down with a voiceover. There is a written caption at the start of each film, linking the image directly to the narrative content of the voiceover. I am interested in the way in which the latter can compensate for the blind spot of the image. In Black Sand the detailed poetry of the voiceover creates a specific emotional atmosphere which contrasts with the generic sterility of the single-shot. See@Sea is an interactive piece that enables the viewer to ask the question 'What is a sea for you?' Hidden words appear and disappear, by touching the computer screen, like fractals of waves coming from nowhere and going nowhere. 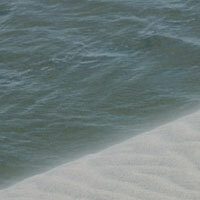 The words resemble thoughts/analogies/emotions that are associated with the sea. The words themselves were taken from letters sent by participants of SeaofSeas, a collaborative global video art work, which answered the same question. Digital technology enables the quick and easy use of written text. Short text messages have become a popular way of immediately communicating something. But face-to-face communication is much richer in terms of the information that can be gained through sound and body language. This kind of information does not exist within digital text but it might exist within a personal vision. See@Sea is a reference to this idea and suggests a vision of words - it is intended to open up a discussion about the way people visualise words. This is a literal fusion of word and image. Ironically entitled Reading with the Master, the piece focuses on the shapes made by the mouth when the poetry is spoken, referring to Billie Whitelaw's performance of Not I by Samuel Beckett. Trying to read simultaneously and synchronise the cadence of the poetry, draws attention to T.S.Eliot's original vinyl recording. His characteristic voice and method of delivery is the backbone of the piece. The onomatopoeic rhythms in the last section, Cape Ann, in Landscapes, evoke the flight patterns of the different birds Eliot saw when he was a boy on holiday in Gloucester, Massachusetts. This is a recorded stream of consciousness, transcribed, and re-read into a dictaphone to alter breath and cadence, word grouping, sentence length, speed. In this work, one still image appears to be animated by text. The UCL Slade School of Fine Art is concerned with contemporary art and the practice, history and theories that inform it. It approaches the study and practice of art in an enquiring, investigative, experimental and research-minded way. Slade facilities and infrastructure for research support the discourse around painting, sculpture and fine art media. In the 2008 Research Assessment Exercise, 70% of the department's research activity was recognised as being in the top two categories of 4* ('world leading') or 3* ('internationally excellent'). This result confirms that the Slade is one of England's leading university departments for research in Fine Art.